For those of you scribblers just joining Twitter for the very first time, there are a couple of tips and tools to know about that will make your tweeting life a little more fun. First the basics. Once you’ve signed up with Twitter and replaced that old egg with your author photo, it’s time to start socialising. You can only see the tweets of people who you follow, and likewise, only people who follow you will see your tweets. The way to get followers when you’re new to Twitter is to start following others. Search for people to follow by name or by putting things like writer, author, photographer, gardener, or any other thing that you are interested in, and follow away. I don’t follow many Twitter sites that don’t follow me back, but that is up to you. As a newbie this is important though, because when you are finally following two thousand people, you can’t follow any more until your follower count matches that, which generally means a lot of time spent trying to unfollow quite a lot of people. This is where the Crowdfire app comes in useful. Log on to it every few days and see who you are following that is not also following you, and unfollow them easily from there. If you’re a busy Indie working on promoting your books, unless you really are interested in certain accounts regardless like Nigella or J K Rowling, there is no point in clogging up your timeline with tweets from people who aren’t interested in yours. Also sign up for Hootesuite to easily see what’s been happening all on one page. Check out popular hashtags to add to your tweets such as the #amwriting or #amreading ones. Check out the trending hashtags on any given day to see if you have anything to add to the conversations. You’re not obligated to follow back everyone who follows you. I do follow back mostly unless a new follower is obviously a bot. These are often spottable by their continuous stream of generic tweets with no retweets in between. Also if someone has tens of thousands of followers and is only following a few themselves, it’s a fair bet that they will unfollow you once you’ve followed them. If anyone retweets your tweet it’s good Twitter etiquette to head on over to their profile and see if there’s anything you can retweet for them to return the favour. Retweet others anyway, and soon you’ll have a fine flock of Twitter friends ready to retweet for you when you have book news or any other important thing to share. 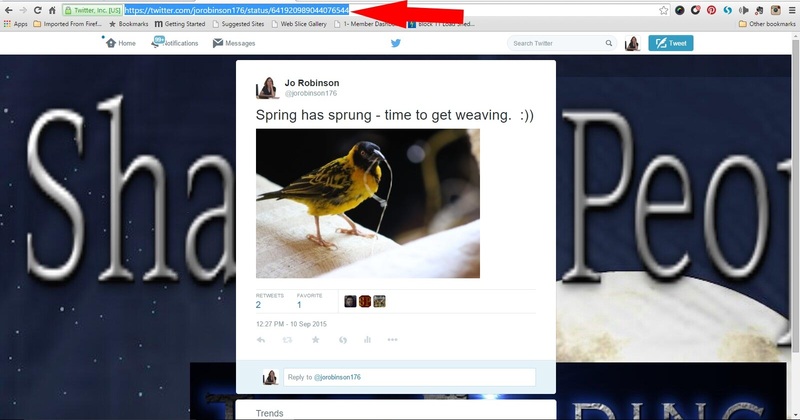 Go to Tinyurl to shorten any links that you want to tweet to twenty six characters. One hundred and forty isn’t a lot to work with when you have a lot to say. Another way of getting more than a hundred and forty per tweet is to create them as images using Canva or Picmonkey or any design software that you might have available. You can also shorten your links with Hootesuite if you plan on using that. Make sure that when anyone tweets any posts from your blog site that your Twitter name gets included when they do, so that you know when anyone is sharing your work, and then you can return that favour too. You can also make certain quotes or sentences within your posts tweetable by using the Click To Tweet app. All of these apps are free so there’s no reason to have to struggle with Twitter. 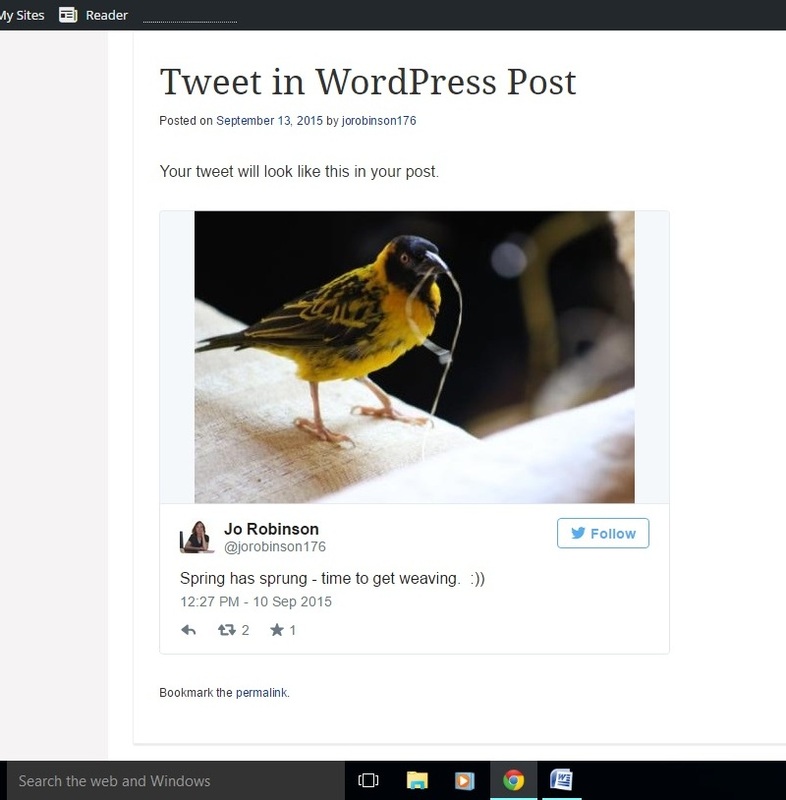 Finally, to include an actual tweet in your WordPress blog, all you have to do is find the tweet you want to share on your blog. Click on the date, which will take you the tweet itself. Copy and paste the tweet’s URL on its own line wherever you want it to appear in your post and have a look on Preview to see what it will look like, and then publish. This was really helpful, Jo. Twitter is so huge that it’s been hard to get my hands around. Your suggestions make it seem manageable! Pleasure. 🙂 Hootesuite really is brilliant, although most of the time I forget about it and dive straight in the long way around. 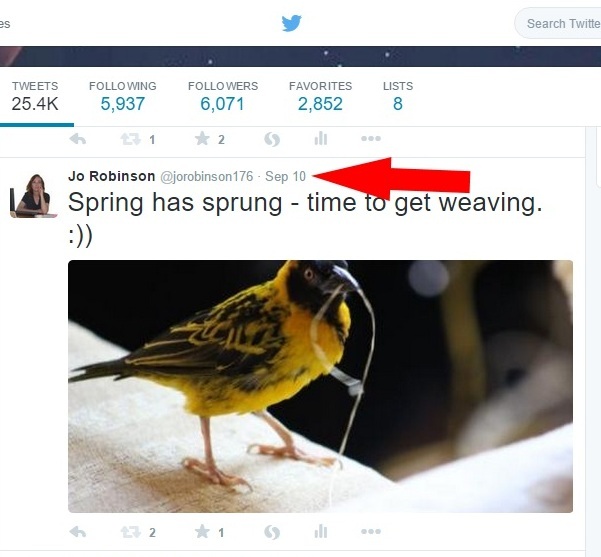 Jo Robinson​ with some more excellent strategies for getting your Twitter account up and running with kerb appeal.. Twitter is my third largest referrer to my blog. If you are an author Twitter is part of your sales package and if you follow Jo’s easy to follow ‘how to’ you will be well on your way. We promised to keep her seat warm Ronovan, she is never far away from our thoughts. Thank you lovely Sally! As a matter of interest, what are your top two referrers? Great tips, Jo — thanks! Have a thriving Thursday!